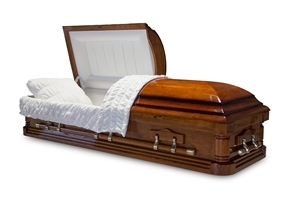 Our cherry wood caskets are constructed from 100% rich, natural cherry wood. They all come with a fully insured product warranty and have a convenient adjustable bed and mattress so you know you are receiving excellent quality. 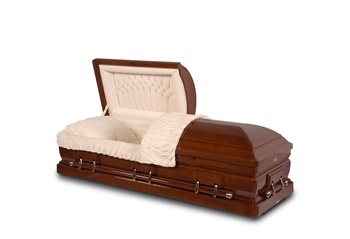 These caskets are a wonderful token to honor your loved one. 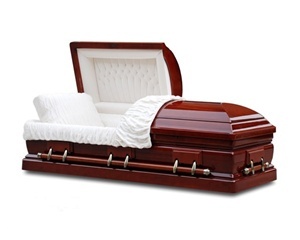 At Fast Caskets, we offer several different styles, so you can find the perfect fit. Our Monticello Casket is lined with luxurious, almond velvet and features intricately squared corners. 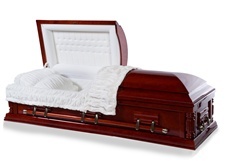 For something with a satin finish, try our Presidential Casket. The Presidential also has a unique tuft and pipe head panel design. Or try our Executive Casket—the solid cherry is lacquered in a high-gloss finish and boasts exquisite detailing and trim. A cherry wood casket is a beautiful way to remember your loved one. Call Fast Caskets today to learn more.